So, I mentioned it a few posts back but I said I'd need a wine in my hand to fill you in, instead I have a head cold and Sunday night's leftover apple crumble, it will have to do. We had a bit of a blowout with our foundations and we ended up needing a lot more concrete than we had allowed for. 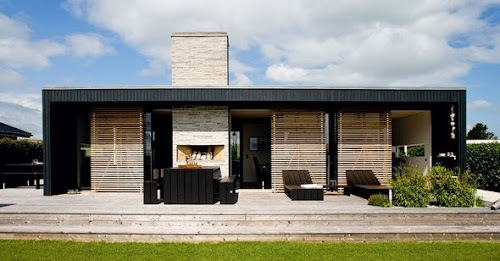 It wasn't a HUGE blowout, not a 'call in Kevin McCloud' kinda blow out, but it was big enough to make us reassess some major features of the house. 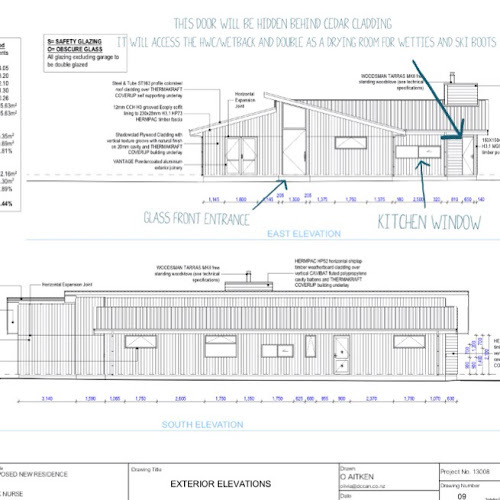 It has meant the exterior design of our house is very different to what I showed you all those months ago...this could seem like a real major....and it would be if what we have changed to wasn't actually my first choice... before I met that Nordic Summer house that I decided I wanted to copy. 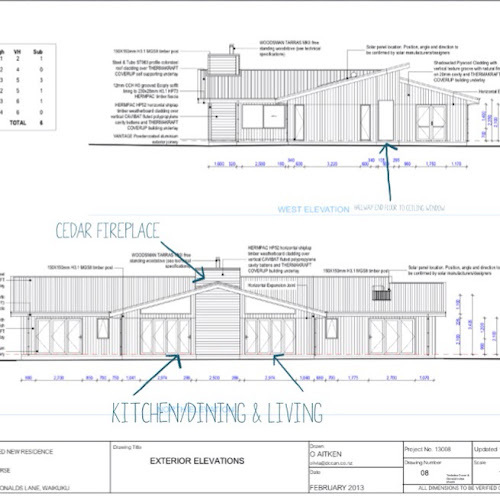 We have said goodbye to the plan of cladding the entire house in vertical cedar shiplap and in the process of this decision we have saved ourselves almost $10,000, KaaaaChing! (That would be more exciting if it wasnt going directly onto things that we are already over on) I suppose we could have just bitten the bullet and borrowed a little more but I just didn't want to, I don't want to build this dream house that we have "future proofed" with extra space and worked so hard on, only to have to miss out on things in the future because we're scrimping to pay the mortgage. 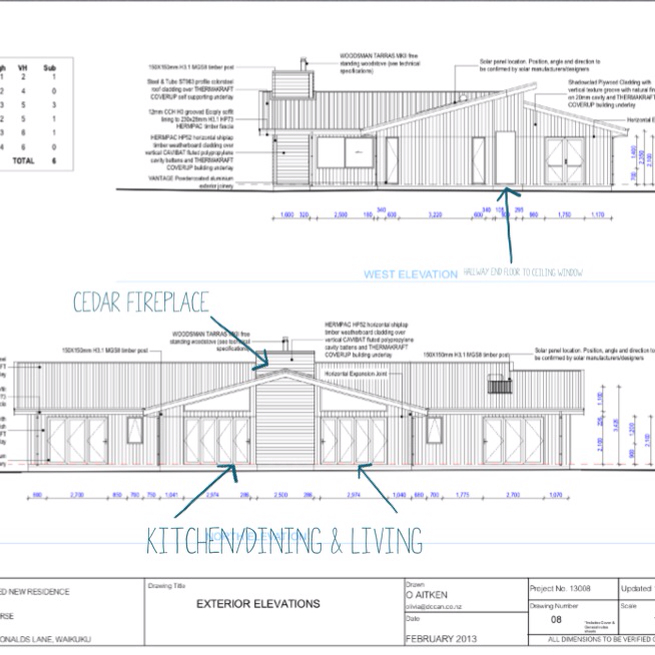 The thing is, our first home was an 80sqm, 100 year old cottage in Lyttelton and we are building this 250sqm home on 2.5 acres with the same sized mortgage. That's a big achievement for us and we want to stick to it like glue (so we can avoid a Kevin McCloud "how much did you actually spend" kinda moment) The reason we can do it for that price comes down to the fact that we spend every moment of our spare time working there and my Father (ex-builder/superman) spends all of his spare time there as well (sorry, you can't have him). 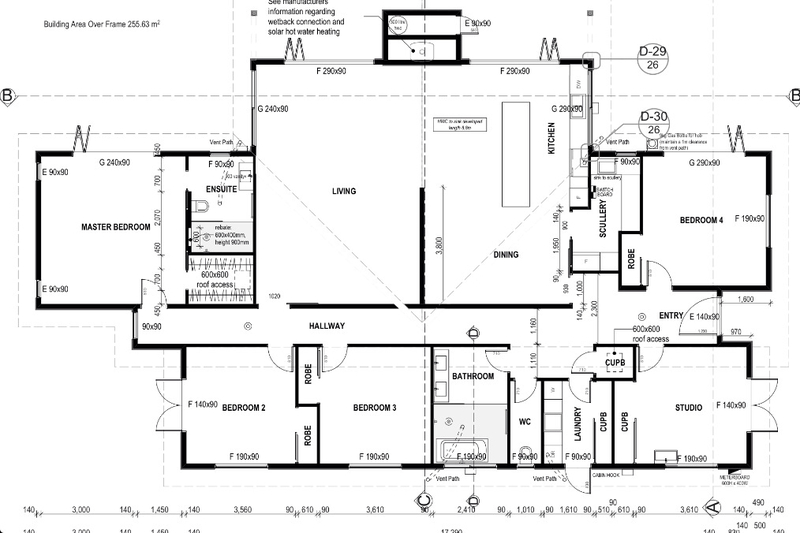 We have also saved wherever possible....Including designing the house ourselves using google sketch up and giving our draughtsman a very good start. That reminds me, I think it's time to share the plans with you. Like I said, we designed it ourselves and we tried to make it as simple as my design focused mind would allow in order to keep the price down by avoiding engineer costs. By the way, your eyes haven't suddenly detoriated, I just don't know how to get a high res image off of a PDF. That tiny writing at the top is trying to tell you that the arrow is pointing to a floor to ceiling window at the end of the hallway. When you stand at the entrance (which you'll see below) you'll look straight down and out of that end window, where there will eventually be a view of native bushy garden. This view also shows how far the fireplace pokes out and you can see we have extended the roof out to just past that point. This gives us some good shade in the summer and the fireplace provides sheltered nooks from either easterly or westerly winds. 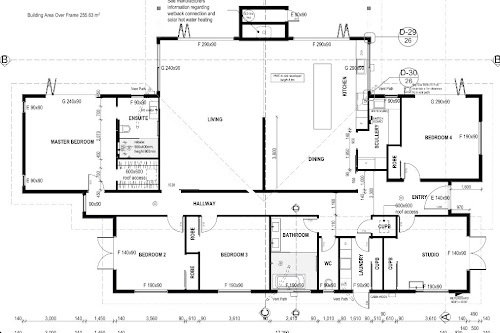 Sorry the floorplan is probably the worst quality.... You're gonna have to get your squint on. We have high ceilings throughout the front side (fire side) off the house and from the entranceway down to the bathroom. Then they drop down to a normal 2.4 stud along the south side of the house, this was done to keep the south rooms a little warmer seeing as they won't be getting any afternoon sun. We are having polished concrete throughout the entire house, excluding bedroom 2&3 which will be sisal carpet. That's Guy Smiley standing in the frame of the front entrance...you can kind of get an idea of the height of the ceilings in that area...and you can see just left of his smiley head where the ceiling drops down to normal height in the hallway. That's me perched where the dining area will be, it gives you an idea of the ceiling height there as well. In the top right corner of the photo you can just see the ridge beam that will be exposed through the centre of the room. Now for the changes to the outside....the exterior is going to be stained black shadowclad (a ply board with vertical grooves in it to give it a shiplap look). 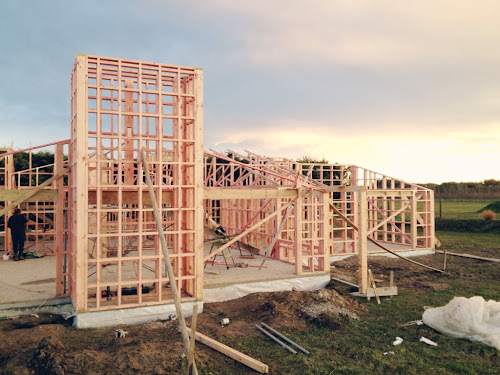 The fireplace exterior and the entranceway wall that will carry on through to the interior entrance of the house will be horizontal cedar, I found some photos online that will give you an idea of the look of the exterior colour contrast. The first pic is almost spot on with the black shadowclad and natural cedar which we will be giving a light coat of stain with a grey-ish wash.
Congratulations if you got to the end of this ridiculously long post. Hope it gives you all a bit more of a vision when you're looking at our pink frames. Wow wow wowwww!!! First- Kevin McCLoud would be soooo proud that you actually stopped to re consider your options re current budget instead of ploughing on ahead to build something that you would have to sell to stop bankruptcy! Congrats you young go getters! The shadowclad is perfect and you will be the only one that will notice the slight difference between its final result and what it may have been. 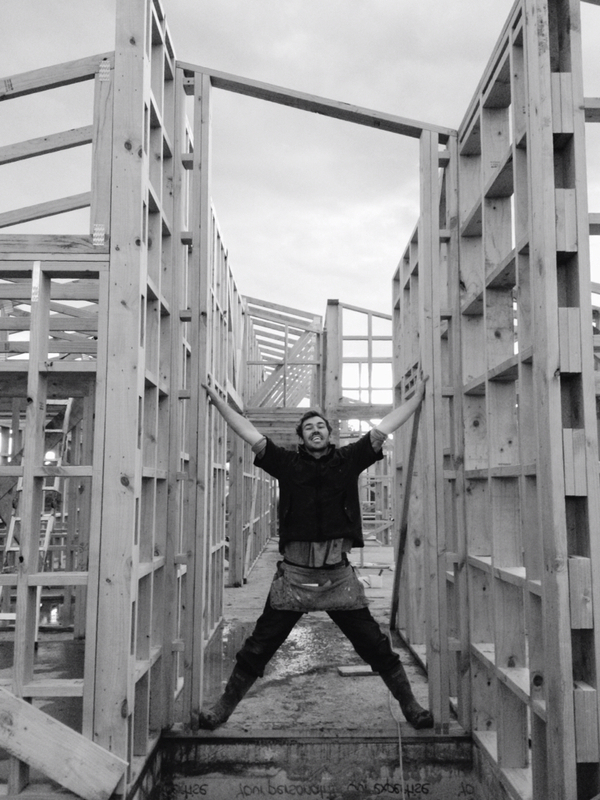 I am so damn excited that you are up to this bit!! Hope to see it all for myself soon. Anyway just thought I'd chime in and say I love it and good job! I LOVE YOUR WRITING!! I can hear your voice....cracks me up. What do you mean you dont have sports gear? haha. It all looks so amazing. 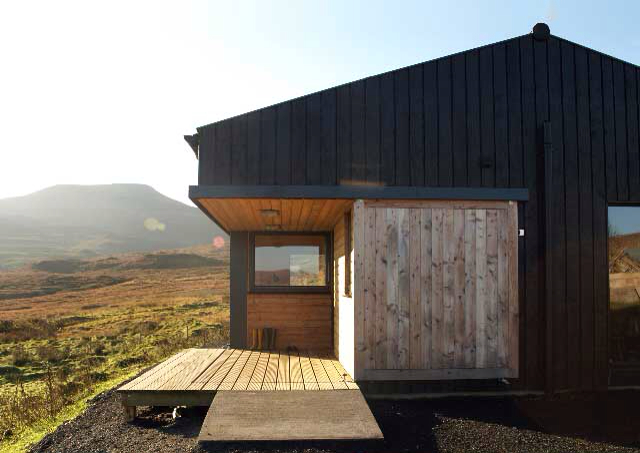 Such a big deal really, considering that gorgeous wee cottage was such a wee dream before that EQ! But look how magnificent this will all be once all your HARD WORK is finished!! Love you guys!! WOW it is going to be amazeballs....of course I LOVE it all miss sytlister, you pretty much have nailed everything on my wishlist in one fowl swoop if I was ever to built. Super excited for you....ekkk can't wait for more updates. Your house looks amazing, and the stained exterior - gorgeous. I met Kevin McCloud once! In London. At the opening of an eco-building in Shoreditch, and he was SO lovely. Actually, I'm just a little bit crushy on him to be honest. He was wearing a crumpled kind of corduroy suit and cons and very charming. Hmmm. Maybe you should have blown your budget out - he could have come and rescued you! Hope you had a great time building your dream Katrina!! I too had always dreaming about building one such house which I daily see in my dreams!! Hope I will get it some day!! 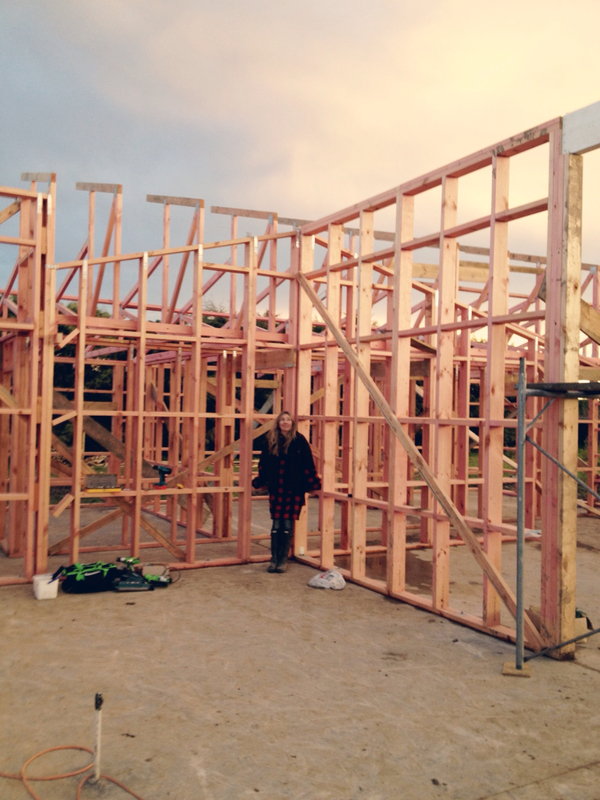 Am loving following the progress on your amazing house! We are planning our own at the moment and wondering if you could tell me the size and profile of your cedar?